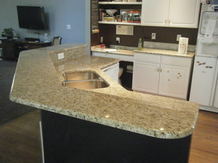 We specialize in selling, fabricating and installing natural stone surfaces including granite, marble and onyx. Our wide selection of inventory in natural stone slabs makes us Atlantic Canada’s largest natural stone supplier. Our beautiful and unique inventory of slabs includes stones of premium quality selected from travelling around the world, from quality factories producing first choice slabs, bringing a world of quality stone to our customers. We are very proud to bring our extraordinary selection into homes, commercial properties, and other facilities across Atlantic Canada and surrounding areas. We strive to know each of our customers on a personal level, as we believe this allows us to better meet your needs and offer better value to you. We go above and beyond expectations to provide excellent customer service. We believe in ensuring customer satisfaction in every aspect of our business, from helping customers with their choice to following up with them after installation. 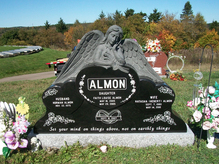 "Bartlett Memorials offers quality service at the best price around and a very quick turnaround time". For more customer testimonials, please visit our testimonials page or our ﻿Facebook page﻿. We are committed to provide the best service possible, as well as the best value to our customers. This has earned us widespread recognition in the local community. 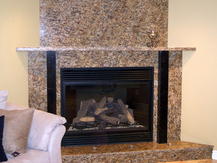 Costs for our granite products may vary depending on the stone, size, and the work required. In order to have the full knowledge of the cost involved for your specific project, you can obtain a ﻿F﻿REE QU﻿OTE﻿ from us. For our budget-conscious customers, we can offer a financing program through ﻿Wo﻿rthingto﻿n ﻿Financial﻿﻿. To learn more about the program, please visit the ﻿Worthington Financial website﻿. You may also find the link to the online application form for the financing program ﻿here﻿. We highly encourage you to stop in our shop and look for yourself! Whereas you can drop by any time during our regular ﻿business hours﻿, our appointments are available 24/7. We are very approachable and always work for our customers' best convenience. So please feel free to email us or give us a call to set up an appointment if you are not able to visit us during business hours. Let us know what you need and we will do the rest! Richard Bartlett initially started Monument Restoration and Lettering Service back in 1999. As the success of this early business continued, Richard evolved it into Bartlett Monuments in 2002, with monument production and design being its new main focus. In 2005, Bartlett Monuments expanded the business to include countertop fabrication and installation services. In the summer of 2008, Saint John Marble & Granite was launched as the first pure importer and wholesaler of granite and marble slabs in Atlantic Canada. This new venture saw a record high in sales and was later merged with Bartlett Monuments which became its present form, ﻿﻿Bartlett Memorials﻿﻿, offering the services of both of these establishments.